The Arecont Vision SurroundVideo Omni G2 12MP Outdoor Network Dome Camera comes with four 3MP sensors, each with a 2048 x 1536 resolution, for a total resolution of 12MP (lenses available separately). The camera incorporates four individual gimbals, allowing each of the sensors to be placed in any orientation around a 360° track for numerous viewing angles. Once the camera is mounted, the operator can focus and position it remotely, eliminating the need to adjust the camera on-site. Equipped with a day/night mechanical IR cut filter, the camera is designed to capture high-quality images regardless of time of day. When lighting is poor, Binning Mode boosts the camera's low-light performance by combining pixels so that more light can be collected. SNAPstream (Smart Noise Adaptation and Processing) technology and H.264 encoding reduce bandwidth use without sacrificing video quality. 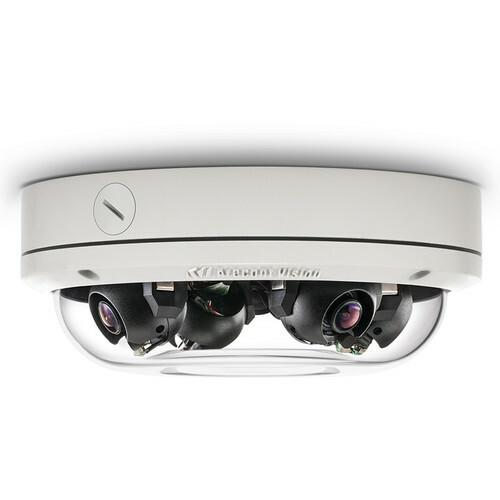 The camera is enclosed in an IP66-rated weatherproof and IK10-rated impact-resistant dome housing for use outdoors and in high-risk areas. Power can be supplied via a single Power-over-Ethernet network cable or an 18 to 48 VDC / 24 VAC power supply. The AV IP Utility tool can be used to quickly configure multiple cameras at one time. The camera is ONVIF compliant, ensuring compatibility with a wide range of network video devices.